In Barbara Buttinger-Förster’s images we encounter echoes of female archetypes such as their emblems and companions. They are like those we can find in the Stone Age reaching back to the matriarchal cultures. Today we can still admire the fragmented written records of the indigenous people in archeological artifacts. The archetypes can also be discovered in tradition, fairy tales and renamed Christian female figures. It is assumed that originally there existed the belief in a mother archetype (Primal Mother). This was the ultimate incomprehensible one – who from her lap created and nourished everything, but then took everything back again in order to give birth to the cycle once more. Gradually one did see this almightiness from multiple aspects, which reflected both her light and dark sides. The mighty mother, mother goddess and creator of the world is continually reintroduced in a three-sided form. Sometimes she appears represented by colors: “The White One”, “The Red One” and “ The Black One”. 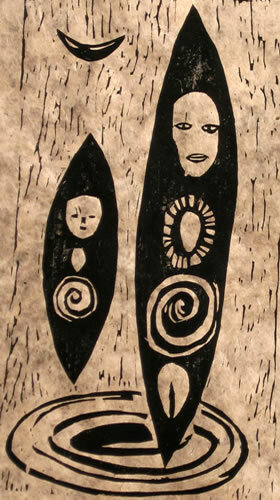 These symbolize the three female phases of life: the girl, the fertile woman and the wise old woman. One sees equivalents in animals and nature, in the cosmos and especially in the seasons of the year. The Christian three holy maidens, Katherine, Margereta and Barbara, remind us of her, as well as the figures of the three “Saligen” (wise women of the mountain) on fairy tales. The names of water (Isar), mountains (Silvretta) and the countryside (Noreia/Noricum) still refer to the multifaceted motherly creator. Instead of today’s biological and masculine focused mindset (for example, sperm fertilizes eggs), the archaic man’s perception was interested in the integrated experience. The mysterious growth and development of life in the mother’s body and and the act of giving birth were perceived by a resonance with the emotional, mental, physical and spiritual sphere. It was an experience that always and everywhere turned towards the mysterious and the unexplainable. It was something that could not be deciphered and could/should never be rationally tangible because it appeared simply „too big“ and too incomprehensible. Archaic humanity responded to this idea with innermost devotion and was given deep, embryonic security. These cultures’ interests in the mysterious were equally intrinsic as the permanent life with analogies. This was in the macro-cosmos just as in the micro-cosmos recognized and re-created by rituals. This safe and warm darkness is where mysterious creation happens and is repeatedly (also in the ritualistic context) perceived. This safe and warm darkness, which is ultimately perceived to be the black mother of humanity and/or her lap, is seen as both an exit into the carnal world and also an entrance into the ulterior one. It was the beginning and the end – in a permanent progression and return: This was clarified through the idea that life is a circle (later depicted as a wheel). What we encounter is a cycle of uninterrupted metamorphosis, through which no one can go astray. The womb was the Celtic cauldron of transformation. (Later it was called the Holy Grail or the “Christian” goblet, an attribute of the holy Barbara for example.) This location of metamorphosis was enabled through the earth and through the woman, both connected and permanently working together. In the same way people left the physical life to return to the fold of the All-Mother, in order to be born again into the other world. They expected a life together with the nearest and most loved ones, who already had travelled this path in happiness and fulfillment. Here one speaks of a worldly and an otherworldly life instead of life versus death, which is how we would name it today. This death is sometimes linked with an imagination of “nothing more.” It is also associated with a tough and difficult dying process and the helpless despair of those who are left behind. One strived to come closer to this otherworldly image through the nursing of certain values and attitudes. They were passed on to the next generation through role models, myths and other stories that were told in songs, prayers and rituals. The border between the mother of all and the real ancestor was perceived to be blurry: The Grand Mother or Grandmother was the one in the archetypes of familial relations, who passed on the protected wisdom and knowledge to the grandchildren. She was the guardian of knowledge and wisdom, and with that, also the guardian of the identity of the tribe and people. She affected both the social togetherness and spirituality of the real-life realm (this was never separated, but always totally intertwined). An archaic society placed tremendous worth on having an empathetic stance while caring and furthering the abilities and knowledge to others as it resonates with the basis of analogies for each and everything. This resonance manifested itself in being permanently in relationship as interchange, balance, compensation as well as mutual support. It culminated in a feeling of being actually related to everything from creation and acting accordingly. This empathy was not only given, but also taken, based on the idea: “As one calls into the forest, so it returns.” – If one had a successful hunt, a good harvest, energy-filled health, vital descendents, or a healthy society it would be traced back to the source. The Grand Mother and her creatures had reacted positively with emotion to the sympathetic understanding, speaking and action. That is how rituals were introduced to all parts of life . They were designed so that they would support and strengthen, as well as balance and cure people. In this sense they could/should also break open the old in order to create the new. This was, amongst other things, important in life transitions. As a society becomes more war-involved, authoritarian and hierarchical, more of the traits described in the foregoing will be lost. Such society-forms are also no longer interested in individual growth which enriches common welfare. In the end the selfishness of few rulers uses arbitrariness and finally violence to push through their ideas. The dedication of the subordinates can no longer exist, when intimidation and slavery are the means of choice. The traumatized personality rises to become the ideal: “the hero.” Through myths and stories he is glorified as being immortal…. Through our history books we see the streak of blood of certain heroes and military leaders. These heroes are magnified and glorified also in many films and videogames, they are imitated and passed on to the next generation. In this way violence becomes a part of education. In opposition, here we experience a woman and art-creator, who through her images constantly traces the previously discussed feminine roots, whereby in later works the aspects of “the Black One” is of growing importance. This happens, among other things, through the change in medium from oil and acrylic paint to egg tempera and natural pigment. The red-coloring changes to a darker one, especially brown tones. This can be seen as fresh blood changing to dried blood. The forms also change from entire bodies to body parts. In a certain way there is a loosening, a dissolving of physical experience, in order to make room for spirituality. The focus moves away from the outside, the events of life (sometimes also in a humorous way) and moves to a view that allows for amazement and awareness, engaging the unfathomable. There also is change in the stroke made: from a vital, at times even aggressive, sometimes scattered one to a focused line representing a mirror of clarity, which opens a numinous “behind” more and more.